Rainy season, or called as 梅雨 (tsuyu), is normally happened in June in Japan. Almost everyday will be rainy, and everyone said that 梅雨 is the most unpleasant time. Yeah, and I expecting that's gonna happened this June. But now it's already mid-June, but where is the rain??? In the end of May, and early June, it was raining and cloudy for a whole week. 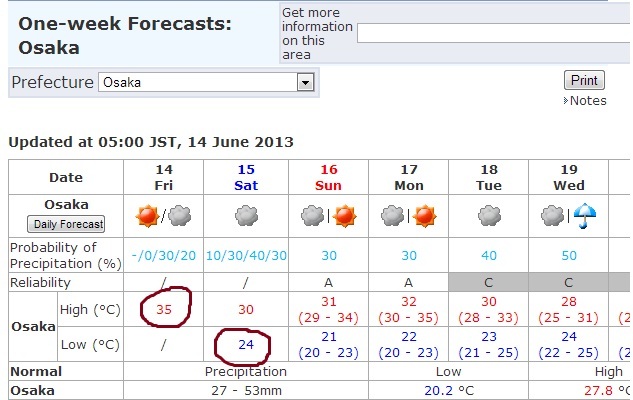 But soon after that, it seems like rainy season is not coming to Osaka. I don't really understand whether it's only in Osaka or in every part of Japan, but I saw on weather forecaster on TV that it's currently rainy for several days in Tokyo and other north-east part of Japan. 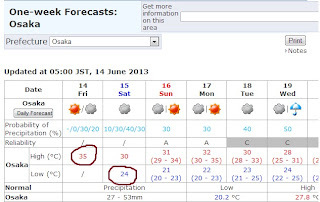 Now, the temperature is really really high 35ºC, even the lowest temperature in the morning is around 24ºC. I do complain about the weather, and also all my friends. Even Japanese said that it's really strange because it should be rainy season by now. But Riho and Airi said that they prefer this kind of hot weather than rainy. Yeah, I'm sorta understand, because I really hate to have my shoes wet because of rain. My other friend, Nai-chin keep saying to me that I should be okay because I come from Indonesia, where it's always summer everyday. No no no, I don't know why but it's different in Japan, it feels hotter and more humid. Well, I'm kinda used to live in Bandung, where the temperature is not as high as in Jakarta. In here, the roads are wider, the trees are less, so there's not many shadow. Another interesting part is about the Japanese women who are really concerned of their skin protection. In order to protect the skin from UV rays, there are many kinds of sun screens or sunblocks or whatever in the drugstore. The one I like the most is the spray type, it's really convenience. There is also a type that can be used also as foundation or BB cream. The minimum in about 30 SPF, but many people prefer to use 50 SPF. Wow. Some people said that UV in Japan in pretty bad. It's not strange to see many women use umbrella while walking around, or even when they're riding the bicycles. Many women also wear skin protection, such as hat, hat with a big and tinted face protector, and long removable hand-sleeves. But many young girls still wearing short pants or mini skirts. It's really strange for me because I think if you want to protect the skin, why don't they just wear the long sleeve clothes and long pants, or may be they should try to wear hijab, hahaha.